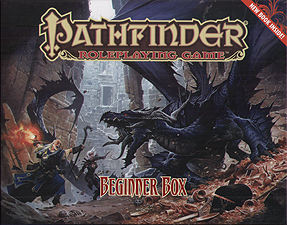 Take your first step into an exciting world of fantasy adventure with the Pathfinder Roleplaying Game Beginner Box! Within you'll find simple rules for creating and customizing your own hero, as well as a robust system for running your character through challenging adventures and deadly battles against villainous monsters like goblins and dragons! Will you master weapons and magic to become a courageous fighter, a wise cleric, a witty rogue, or a brilliant wizard? All the details of your character are yours to control. The only limit is your imagination! NEW BOOK! A 16-page Transition Guide to bring your hero to the full Pathfinder Roleplaying game.